Get your old-school gaming fix on! Dice Roll Zine is a 36-page, booklet-sized zine for OSR RPGs written by Steven A. Cook and illustrated by some of the best OSR-influenced artists around. The premiere issue includes a barbarian class for B/X games, a saving throw-based method for turning undead in B/X games, a trippy sci-fantasy adventure location called The Purple Mushroom Inn, a chaos mutation die drop table, a collection of random 'dungeon stuff' tables, and other optional rules for old-school games. Files Included: Lots of files in the download. 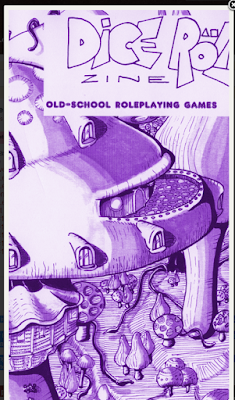 Along with the PDF you multiple cover options and all of the map files (.png format) for the issue: The Purple Mushroom Inn (2 maps), Peshar's Bandit Lair (1 map), and the first-level of the (unkeyed) megadungeon Treasure Vaults of Nargu Qa'Dash (4 maps). The mag is $3.76 CAD and well worth it! First off it has a B/X Old school flavour to it. There's a LOT of great art within. I am in love with the cover (honestly a toadstool inn! way to hit right close to home on that one boys!). How to resolve anything that comes up: An article on ability scores with a awesome table. Turning Undead: A different way of dealing with creepy undead that should have stayed dead (b/x). The Purple Mushroom Inn: A sci fantasy adventures site for low mid level characters. (Damn this is awesome!). Complete with rumor & adventure table, menu, NPC staff, detailed personalities, and wonderful tavern map (and underground lair). Random Chaos Mutant Die Drop Table: Great table with a pile of weirdness. Random Dungeon Stuff: A bunch of excellent tables for dungeon crawling. Mega Dungeon Maps: The Treasure Vaults of Nargu Qa'Dash. There are 4 extremely detailed dungeon maps (all hand drawn), combined with the random dungeon stuff tables, and a few wandering monster tables, you basically have a game ready to go. (of course a bit of inspiration). 1. To return a ring to a lost love. (Long ago a dark elf maiden fell in love with a traveler, it was his dying wish to have her ring returned). 2. Hunting expedition. The coats of the shaggy beetle are extremely sought after, and worth quite a lot of gold. 3. Recently a Gnomish Caravan came to the surface with trade goods. Turns out that the good they sold are all defective. They need to be returned and the gold paid retrieved. 4. A local scholar will pay for detailed maps of the dungeon. 5. The source of the death shadow plague points towards the depths. 6. In the darkness there are rumblings, causing structures on terra firma to fall down and crumble.